This systematic review evaluates the diagnostic accuracy of preschool vision screening tests for the detection of amblyopia and its risk factors. The literature searches were conducted in nine bibliographic databases. No limitation to a specific study design, year of publication or language was applied. Studies were included if they compared a vision screening test with a reference test (gold standard) in children from the general population. In addition, the studies had to provide sufficient data to calculate diagnostic accuracy (sensitivity and specificity). Full-text articles were assessed for studies that satisfied the inclusion criteria using the “Quality of Diagnostic Accuracy Studies (QUADAS)” checklist. Two studies with a longitudinal design and 25 cross-sectional studies met the inclusion criteria. One of the longitudinal studies compared a screening programme in children between 1 and 2 years of age with a re-examination at the age of 8. The sensitivity for the screening programme was 86% (range: 64–97%) and the specificity 99% (range: 98–99%). The second longitudinal study compared screening examinations at 8, 12, 18, 25 and 31 months, with a re-examination at the age of 37 months. In this study, the sensitivity of the screening examination increased with age, while the specificity remained unchanged. The cross-sectional studies evaluated different screening settings, visual acuity tests, auto- or photorefractors and stereo tests. A large variety of reference tests, differing criteria for defining amblyopia and its risk factors and methodological limitations of the studies prevented a valid data interpretation. Diagnostic test accuracy of preschool vision screening tests can only be sufficiently investigated after establishing age-related values defining amblyopia, refractive errors and binocular disorders. To address these questions, we recommend a controlled longitudinal study design. The project was referred by the Federal Joint Committee (Gemeinsamer Bundesausschuss, Auf dem Seidenberg 3a, 53721 Siegburg, Germany) to the Institute for Quality and Efficiency in Health Care (Institut für Qualität und Wirtschaftlichkeit im Gesundheitswesen [IQWiG], Dillenburger Str. 27, 51105 Cologne, Germany). IQWiG commissioned the review to be prepared by Kleijnen Systematic Reviews Ltd and the German Cochrane Center. IQWiG prepared the final version of the full study report on which this paper is based, and funded the researchers and authors. JK, RG and SL developed the protocol and design of the study. Study selection and data extraction was carried out by CS, JK, SL, RG and RR. WL provided clinical advice, and GA provided methodological support. 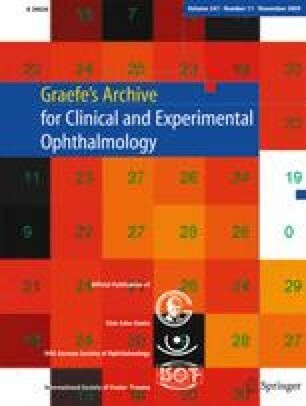 All authors were involved in data interpretation and had full access to all of the data, and they agree to allow Graefe’s Archive for Clinical and Experimental Ophthalmology to review their data upon request. CS wrote the paper. All authors commented on drafts of the paper and approved the final version. (baby or babies or newborn or neonat$).mp. (CHILD$ or ADOLESC$ or JUVENILE$ or MINOR$ or SCHOOL$ or KINDER-GARTEN$ or PRE?SCHOOL$ or NURSER$).ti. (CHILD$ or ADOLESC$ or JUVENILE$ or MINOR$ or SCHOOL$ or KINDER-GARTEN$ or PRE?SCHOOL$ or NURSER$).ab. ((heredit$ or retinal or macular) and dystroph$).mp. (test or tests or testing).mp. ((optic$ or vision$ or visual$ or filter$ or lens$ or glass$ or spectacle$) adj3 (occlusion or penali$ or patch$)).ti. ((optic$ or vision$ or visual$ or filter$ or lens$ or glass$ or spectacle$) adj3 (occlusion or penali$ or patch$)).ab. ((single or double or triple) adj blind$3).ti. ((single or double or triple) adj blind$3).ab.